Watch Home DVD movies on your iPod without carrying so much more Home DVD discs. Now, 4Media DVD to iPod Converter can make it. The Home DVD converter for iPod can convert Home DVD movies to iPod MP4/MPEG-4 video, as well as iPod audios like MP3, AAC and M4A. And the output iPod videos can be played on all iPod models: iPod touch, iPod classic, and iPod nano.Support for NVIDIA CUDA and AMD APP technology, up to 5X faster processing performance is delivered. 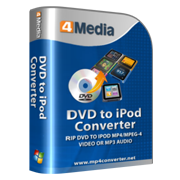 4Media Home DVD to iPod Converter can convert Home DVD to iPod video by customizing file size by a bitrate calculator, splitting file and converting DVD's any segment, certain subtitle and audio. The Home DVD to iPod software supports batch conversion and multithreading that allow you to convert chapters or titles one by one. With these features, just enjoy your favorite Home DVD movies on iPod. 4Media DVD to iPod Converter can convert all kinds of DVD movie to iPod MP4/MPEG-4. The DVD converter for iPod supports all popular iPod models: iPod touch, iPod classic, and iPod nano. The DVD to iPod Converter can Convert DVD movies to iPod audios like MP3, M4A and AAC to get the background music you like. You can view the DVD info retrieved from Internet, such as DVD cover, title/chapter names, film name, director, and actors/actresses, etc. Add multiple iPod profiles or formats for one source file and convert at the same time to get many files at one time. Or clone the title to get its copy and choose multiple profiles to output instantly. Using 4Media DVD to iPod Converter, you can split your DVD into several files with proper file size by customizing file size or time length, or choosing offered size for playing on your iPod. Get the file size you want by the smart Bitrate Calculator. Just enter the file size in the tool and the size of the output file will be what you want. With 4Media DVD to iPod Converter, you can choose desired subtitle, audio and angle of DVD movie to convert. With batch conversion and multithreading support, the file conversion will be finished with fast conversion speed. Support finishing the conversion in the background to save your CPU time and make your other works smooth; No need to wait the long time conversion to the end by setting a post-conversion action. 4Media DVD to iPod Converter lets you preview the DVD movie and take a snapshot at the same time to get the movie scenes you love. Easy power management function is available in this DVD to iPod converter. Five interface languages you can choose: English, German, French, Spanish, Japanese and Chinese. It provides the function of "Run Background" and 5 "After Converting Done" options to enhance your computer's performance. How to convert DVDs to iPod movie MP4?